Two Chicks On Books: Blog Tour- DEATH MARKED by Leah Cypess and a Giveaway! 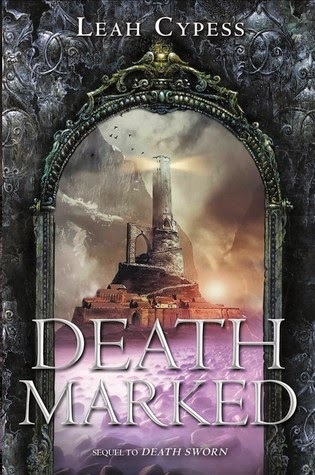 Blog Tour- DEATH MARKED by Leah Cypess and a Giveaway! I am so excited to be able to host a stop on the DEATH MARKED Blog Tour! Leah is deep in her editing cave but we wanted to do something for this amazing book so a few of us bloggers and fans decided to do our own posts with Leah's go ahead of course!! I loved this book and am dying to get my hands on book 3! Make sure to enter the giveaway below for a copy of the book courtesy of Leah! Haven't heard of DEATH MARKED? Check it out! I decided to take some of my favorite quotes from DEATH SWORN so I don't spoil anything in DEATH MARKED and share them today! “Who says I don’t?” Ileni retorted. An Assassin whirled past them, launching himself off the rock floor and tumbling over twice in midair before landing lightly on his feet. Sorin rolled his eyes and took her other hand. His hand was fine boned, but rough and calloused. He pulled her close with casual strength and grinned down at her. “His dark eyes searched her face. "But you love me," he said finally. “His eyes met hers, cold and deadly, and the dagger's edge pressed against her skin. Then his expression shifted into horror. He lowered the dagger and stepped back. "Ileni. That was not smart." “Every person we assassinate dies to serve a greater purpose." “And then he hesitated. He turned his head and looked across the chasm at Ileni. Their eyes met, and his weren't deadly and focused at all. They were . . . afraid. I wrote my first story in first grade. The narrator was an ice-cream cone in the process of being eaten. In fourth grade, I wrote my first book, about a girl who gets shipwrecked on a desert island with her faithful and heroic dog (a rip-off of both The Black Stallion and all the Lassie movies, very impressive). After selling my first story (Temple of Stone) while in high school, I gave in to my mother’s importuning to be practical and majored in biology at Brooklyn College. I then went to Columbia Law School and practiced law for almost two years at Debevoise & Plimpton LLP, a large law firm in New York City. I kept writing and submitting in my spare time, and finally, a mere 15 years after my first short story acceptance, I sold my first novel to Greenwillow Books (HarperCollins). 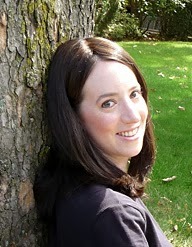 I live in Brookline, Massachusetts (right outside of Boston) with my husband Aaron, a researcher and doctor at the Joslin Diabetes Center, and our three children. 1 Grand Prize pack signed copies of all 4 of Leah’s books (Mistwood, Nightspell, Death Sworn, and Death Marked), plus signed SWAG! US Only. So excited to read this, I've heard NOTHING but amazing this about this series! You chose some great quotes. I feel a connection to the characters and am hooked already! Thanks for sharing this series and author. Wow! What an awesome giveaway! This series sounds fantastic - but I hadn't heard of it until I saw your post. Thanks for the giveaway! I love fantasy books and this is one that I have been dying to read!! !